Dead Space is a fantastic, fantastic game. Dead Space is a third-person science-fiction horror game. Your character exists. A large spaceship exists. A shitton of zombies exist. Mix and enjoy. Technically, other humans exist as well, but in terms of gameplay they're really only there for cutscenes. There is you, and the ship, and zombies, with the zombies attacking you when you do not expect it and scaring the crap out of you. This is not Doom-style "a closet opens in the wall and a monster pops out, and you kill it, and you grab the health pack in the closet, and a second, smaller closet opens up and another monster pops out". This is "you hear a squeaking down the hallway and moving shadows, and you inch around the corner and finally see a bloody corpse hanging from its neck through a vent shaft, and then you turn around and something tries to claw off your face before vanishing through a hole in the floor. Also, there's clanging noises and screams coming from around you." It's actually quite, quite creepy, and extraordinarily well-done. I quite recommend picking it up, assuming you enjoy playing scary things. As anyone who's been reading this journal knows, this means I'm going to complain about it. That's just the way things seem to be going. Dead Space is an immersive game. If you're "playing a game", zombies aren't going to scare you. If you're actually fighting your way through a derelict spacecraft, they are. One of the critical and most difficult parts to any immersive game is to not break immersion. This is hard. Very hard. 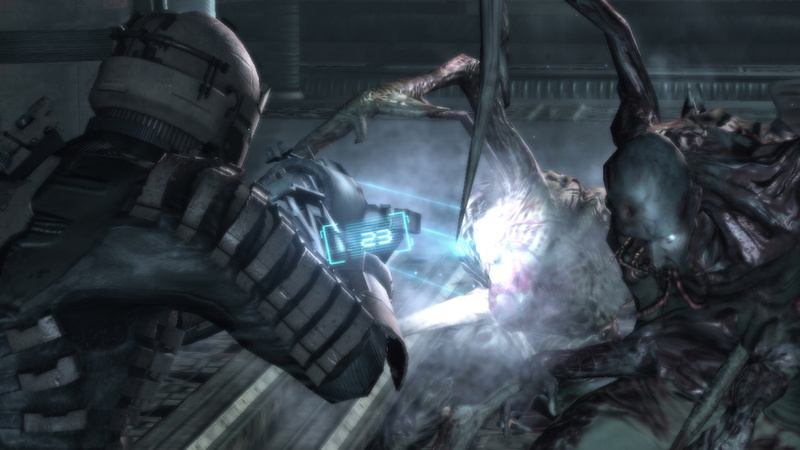 Dead Space goes to extraordinary lengths not to do so. For example, there's no HUD in Dead Space. You can see your health by looking at your character's back (third-person, remember). Your inventory screen, and any windows or tooltips that pop up, do so via in-game holograms that exist in 3d space. Turn the camera and you can see the hologram from another angle. Monster jumps at you, and, well, it's not like the game pauses – now you've got a monster on your face with an inventory screen obscuring your vision. Good move, dude. Video cutscenes? Another hologram projection from your helmet. "Click here to pick this item up"? Another hologram projection, centered on the item. Everything – and I do mean absolutely everything – exists within 3d space in the game world. Largely, it works. We, as game developers in general, have gotten better at this sort of thing. It's a constant battle, but one we're winning. Dead Space has three problems that I've found. Three big, complicated problems, that deserve their own entries. So I'm giving them their own entries. Yeah, this is a series. So there'll be another post in a few days. What common, constantly-ignored immersion issues do you see in games? What common problem causes you to go "hey, wait! This isn't real!"